I returned to UrbanPromise after being away for ten years working on prison reform. For several months prior to starting in June of 2010, I was on cloud nine. I had met David, the love of my life. David was also dedicated to prison reform, and we were planning our move to Camden and our future life together. On his last day at work in California, David was shot in a mall parking lot. He died in an ambulance en route to the hospital during rush hour traffic. His death went unsolved for six months until two days before Christmas in 2010. His killer tried to collect the reward money, and he was arrested. He was a mentally ill client that David had helped, housed, and equipped to free himself from addiction. I was inconsolable. In this, my darkest hour, I did not see how I could step into a leadership role at UrbanPromise. How could I bring value to a place and a people in such poverty and pain, as my beloved City of Camden, when I was in so much pain myself? Family and friends were so kind and patient during this time, but it was so painful to hear their questions about his unsolved murder. It was easier not to talk than to hear speculation about whether or not he was in some way at fault for his death. Yet God gave me moments that let me hold onto hope – a hope that Joy was not permanently dead. Moments of peace came to me often through scripture, CS Lewis, and a special passage from Kahlil Gibran: "Your joy is your sorrow unmasked. And the selfsame well from which your laughter rises was oftentimes filled with your tears. And how else can it be? The deeper that sorrow carves into your being, the more joy you can contain." I did come to UrbanPromise. Here, I began meeting children who had lost their parents and meeting parents and grandparents who had lost loved ones too soon. Three of our kindergartners (now 7th graders) had lost parents. One mom invited and then drove me to a grief group at a local church. One grandmother would stop by my office to talk to me every morning. She would tell me about losing her husband, how she felt, what she did to heal, and how she got through it little by little. I can't imagine being anywhere but at UrbanPromise during this time. What a gift to be surrounded by a community of people who understood my sorrow, who brought comfort without judgment, who withstood my tears and loved me through this time of great sadness. And they are the same people who now—seven years and three children later— who celebrate with me at adoptions, birthday parties, and baptisms. As written in the passage by Gibran, my joy is made greater because of the deepened place that contains it, the place carved out by sorrow. 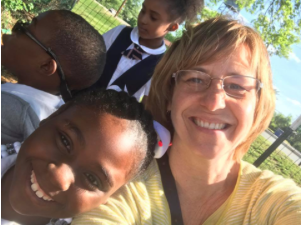 It is thanks to what God does through this beautiful UrbanPromise community of children, parents, staff, and volunteers that I can say -- Yes, I've been blessed, not in spite of, but because of my mourning. Jodina Hick is our amazing executive director. Jodina heard Tony Campolo's message about making a difference with one's life when she was in high school. This influenced her greatly and led her to pursue a degree at Eastern University, a providential introduction to Bruce Main and a job at UrbanPromise. Jodina is responsible for starting our StreetLeader program and the UrbanPromise Academy during UrbanPromise's first decade. She eventually went on to law school and into prison reform. Jodina is passionate about prison reform and is proud to have helped change egregious laws that impede life after incarceration, including local, state and federal laws. Jodina has three children (8, 8, and 2) and she loves spending time with them, as well as reading, gospel music, British detective shows, and opera. No one becomes a teacher because he or she thinks it will be boring. Every day in the classroom is exciting no matter what is thrown your way. Some days, you have to be ready for students to be loud and not focused on tasks. This was one of those days. It was a Monday and my students were still on the ‘weekend grind’ and having difficulty transitioning back into 5th grade mode. As lunch approached, the only thing I was hungry for was the 25 minutes of quiet, a chance to plan how to refocus my class for afternoon instruction. When our students go to lunch, they cross 36th street, which is an arterial road through the city. I stood in the street as 5th grade and middle school crossed one way and the entire elementary school crossed the other direction back towards school. Cars became annoyed at the long line of students coming and going from the cafeteria. Waving ‘thank you’ with my hand was not enough to calm the horns from the idling cars. Just as I thought to myself, “Another manic Monday” I felt two hands grab around my waist. I quickly came to and realized a kindergartener named Kennedy had been hugging me. I smiled down at her huge grin and reciprocated with a hug. She looked up at me and said, “ I love my school! 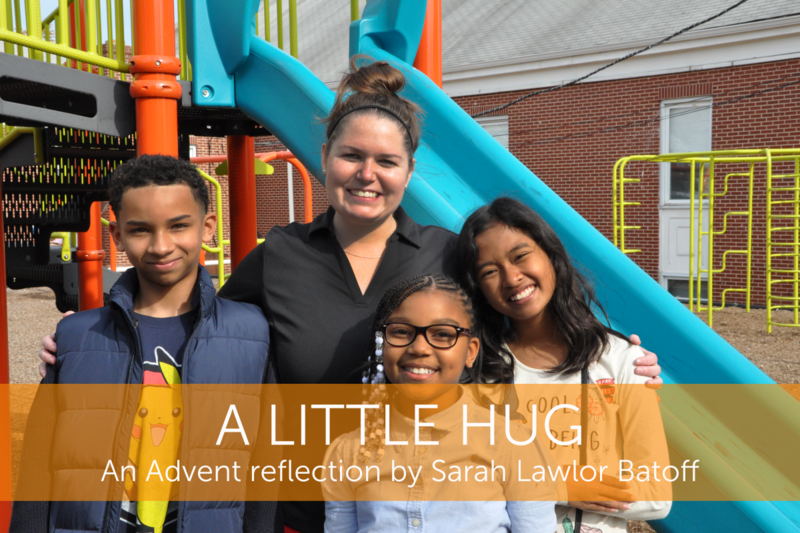 I love you, teacher and I never want this moment to end!” Peace quickly passed through my body as I stood in the middle of 36th street being hugged by a kindergartener as students and cars waited. Any anxiety I had about the afternoon washed away with the innocence of the child in that encounter. Our class ended up having a very productive and positive afternoon. I was so grateful that God was able to show me peace in a hectic situation. Reflection: Reflect on your week and identify two or three moments where you experienced love from an unexpected person or situation. About Sarah: This is Sarah's third year teaching 5th at UrbanPromise. Her favorite thing about teaching is working in an environment full of love from students, families, and teachers. Plus the kids always are keeping her on her toes so it's never boring Sarah is also an avid Eagles and Harry Potter fan. Her last meal on earth would be a Chik-fil-A sandwhich and Michelle Obama is her ideal best friend. I was teaching UrbanPromise Academy sophomores about how emotions play out in our bodies when Andrea’s eyes opened wide. She slapped her open hands, palms down, on the black chemistry table then slid her hands toward her, leaving trails of sweat. “This! What does this mean? ?” She didn’t understand what was happening in her body and that made her afraid and anxious. Growing up in concentrated urban poverty means too many of our children experience toxically stressful living situations, filled with unpredictability, hunger and exposure to violence. The universal human response to chronic adversity is numbness...because you can’t stuff down bad feelings without pushing down good feelings too. It’s just the way we are wired. Ours is an incarnational faith. I believe Jesus came in a body for a reason! Our bodies are sacred; and when they are trying to communicate with us, we need to listen. That’s why we focus on teaching about emotions, and empower our youth with mindfulness practices, teaching how to get in touch with their bodies, emotions and thoughts with compassion and without judgment. We learn to look at and to love ourselves through God’s eyes. By asking Andrea, “What happened to you? ", she was able to connect her sweaty palms to her father’s anger towards herself and her mother before school that morning. This realization occurred at UrbanPromise - a loving, safe, predictable and relational environment. A place of healing. This insight helped her know that she wasn’t crazy and lessened her fear about her body. She came to understand that by listening to her body she could gain a sense of control. This season we celebrate Emmanuel, Christ with us. This incarnate Word points the way to deep healing from the brokenness of this world; brokenness with which our youth are all too familiar. 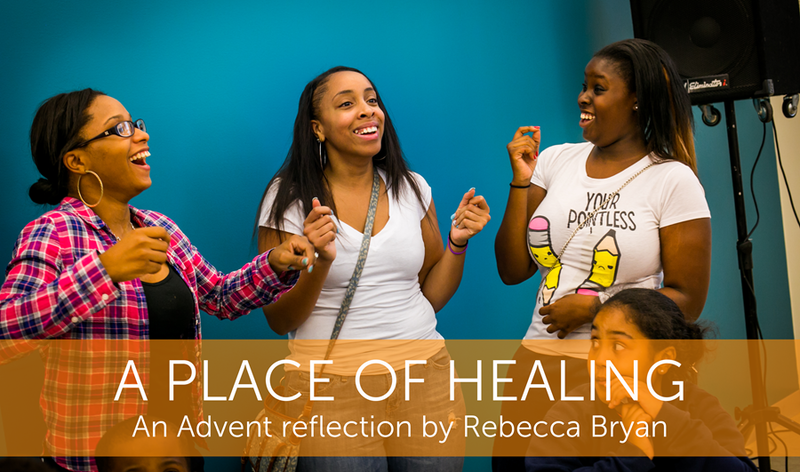 Learning acceptance of what is - in our bodies—opens the door to hope for what can be...lives lived with intention, called to serve the one who was born in a lowly manger. Rebecca "Becky" Bryan is our amazing Wellness Center Director. She is known for being extremely gullible; she has been enthralled with Helen Keller since grade school, and can even sign the alphabet in stereo (both hands simultaneously). 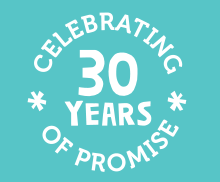 Before coming to UrbanPromise in 2012, she was a nurse practitioner for 20 years in primary care. Becky is currently earning her DNP from Rutgers University-Camden. Click here to read her recent article in The Journal for Nurse Practitioners. I had a student named Hope, and each time we would greet one another I would point my index finger in her direction and say “Hope!” and she would respond “Gotta have it.” Hope—I can’t imagine living without it. A child is born, wrapped in swaddling clothes and laid in a manger because there was no room in the inn. 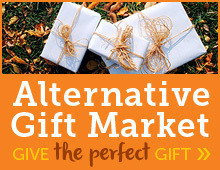 Was there ever a day God gifted us with greater hope? I’d give the resurrection a close second. For Hope is an essential part of Faith. It is the reason to live each day with wild and crazy hopes for tomorrow. She was angry and often miserable…I would wonder why she would sign up for all those Trekker trips in the early days. Was her mission to make me miserable? As I got to know more about her I learned she had been abandoned by her Mother and there was no Father in the picture. She was failing in school, and didn’t seem to even care. She had given up…she was without hope. Yet she kept coming on those Treks. But in time she began to feel safe and I could see a childlike playfulness emerge…at first, I began a playful tease in return, until she allowed me to get to know her and the challenges in her life. Those Treks took her to places she never imagined and experiences that allowed her to dream of what could be. She graduated from high school and went onto advance vocational education. That was more than ten years ago, we keep in touch for we both owe so much to each other. We gave each other Hope! A child is born, wrapped in swaddling clothes and laid in a manager, because there was no room in the inn…and the world changed. May you have a hope filled Christmas! Jim once spent 6 months taking weekly voice lessons so he could sing the Ave Marie in Latin at his nephew’s wedding. He also lived inside a Drive-in movie theater. 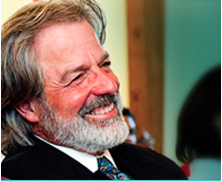 Jim is better know around UrbanPromise for founding UrbanTrekkers, UrbanPromise’s expeditionary education program. The program provides hands-on learning and journey-based experiences to around 100 youth each year. Please contact Jim if you are interested in booking him for an upcoming wedding. "Her husband kicked her and the nine children out of his house," shared my friend Peter Kitayimbwa. "She came to me destitute and begging for help." The situation appeared to be hopeless: a homeless mother, a bunch of kids, no job, no education. She needed immediate help, but Peter was in no position to sustain a family of ten. "I told her to go find seven other women in the village who wanted to improve their lives," continued my friend, "And I'd give them each a $200 loan to start their own business." Peter, who just served two years with UrbanPromise Camden in our Fellows program, returned to his native Uganda this past June to bring hope and transformation to his village. "We found her temporary shelter, she assembled the group of women, received the loan, and bought seed, chickens and goats. Within the last eight months she fed her family, saved her extra income and completed construction on her new home--and it’s bigger than her former husband’s!" 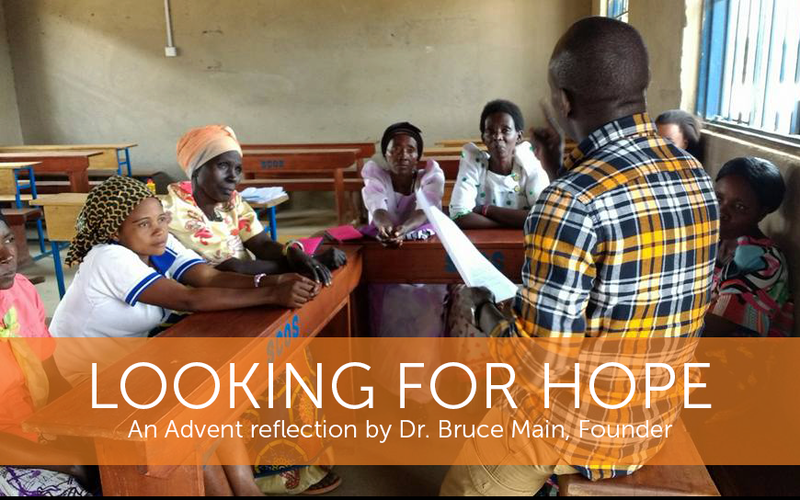 I don't know about you, but my soul is thirsty for hope this Advent season. It is not easy to find. Contentious and deep political and racial divisions, an impending nuclear crisis in North Korea, mass shootings, stories of sexual harassment grab all the headlines and make all of the noise; there is no reason to believe that things will get better. But then I think of Peter. I think of how hope is a gift that God gives ordinary people to share with those who have no hope. People pass hope. My challenge, these next few weeks, is to search for hope, share hope and celebrate hope. And when I find stories of hope--like my friend Peter’s--I'm going to allow these living testimonies to nourish my soul pass it to others. Have you seen an expression of hope today? How can you "pass hope" on to other people this week? 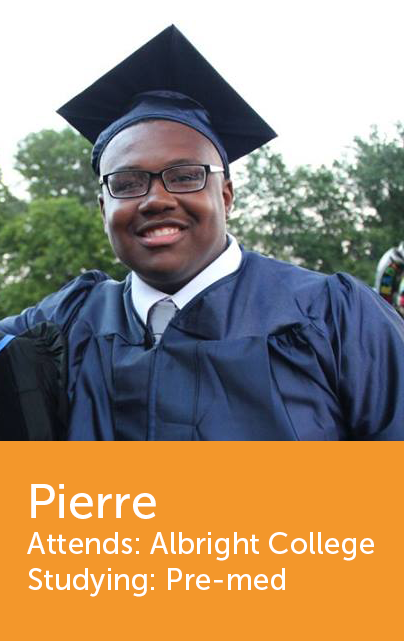 Masira is one of our outstanding 11th graders at the UrbanPromise Academy in Camden. Her world has forever changed because of an unlikely relationship—a friendship with a young Malawian leader name Vanessa Mwangala. Vanessa is an UrbanPromise Fellow who trains with us in Camden. 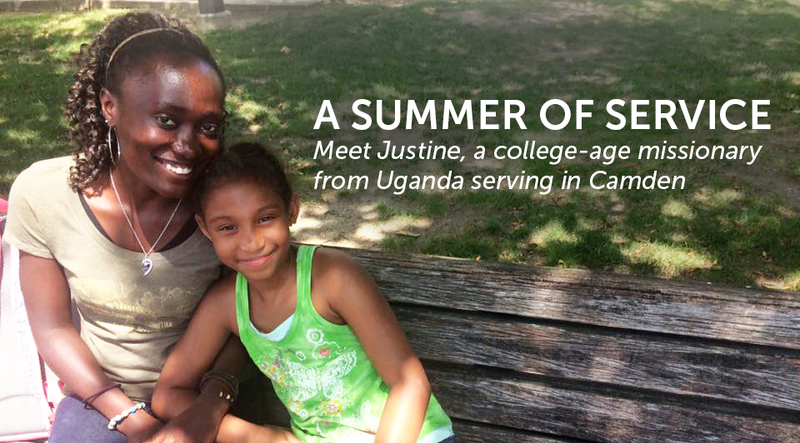 Her dream is to go back to Malawi next May and create an UrbanPromise-type program focusing on female empowerment. Malawi, an extremely poor sub-Saharan country in southeast Africa, desperately needs leaders like Vanessa who will create opportunity for young women. UrbanPromise Camden is preparing Vanessa. But while Vanessa trains, she’s also impacting our students in Camden, especially our teenage girls. Vanessa is opening the eyes of our young women—like Masira—to what poverty looks like in different parts of the world. Masira’s lessons are growing deeper each day as she learns about poverty around the world: the luxury of shoes, electricity, meat, indoor plumbing, and education—things she takes for granted. That is a powerful statement when it comes from a young person who lives in a city entrenched in poverty (currently 42% of Camden’s residents live below the poverty line). At UrbanPromise, even as we care for our young people and help meet their most basic needs, we are also teaching them not just to receive, but also to give. This Thanksgiving as we continue our tradition of providing a turkey dinner to families like Masira’s, we celebrate seeing our young people develop a different perspective, understand the value of service to others and have gratitude for what God has given them. Masira and her friends are empowered to be part of the solution for Camden and beyond. Masira is even planning a future trip to Malawi! Having friends like Vanessa and Masira challenges me to “see things differently” and has deepened my own practice of gratitude and appreciation for life and God’s amazing gifts. In the coming days, UrbanPromise will encourage our children, families and staff to practice gratitude. Once again, Thanksgiving dinners will be served around the city of Camden for hundreds of children, parents and community members. This annual tradition of breaking bread together dates back 29 years. Families will gather with our staff to celebrate God’s goodness. As a community we will pray, sing, enjoy good food, deepen friendships, and practice gratitude. As you contemplate your blessings this Thanksgiving, I hope you will share your abundance with our children and families. One delicious meal of turkey, yams, collard greens, and pumpkin pie costs a mere $6.50, 5 meals for $32.50, a table just $65. Thanks in advance for the blessing of your gifts. Yes, that's right. I'm taking my wife of 29 years on a cruise down the Delaware River in a canoe! This weekend, we’ll put our marriage to the test by spending 8 hours in a canoe together – something we’ve never done! Sound like fun? Pam has been a great sport over the years to put up with me. We actually got married one month before officially starting UrbanPromise in 1988. She has been an amazing partner in building this ministry through all of the ups and downs. Pam has seen the significance of our work in Camden and believes our children deserve an amazing summer camp experience. We hope you’ll support Team Main as we strive to raise $50,000 for UrbanPromise Camden summer camps. Every dollar raised will go directly to feed children, cover trip costs, fund staffing, and provide an amazing 6-week summer camp experience for nearly 500 children and employment for 100 teens. These programs are truly life changing and life giving. Thanks for the many ways you have supported our efforts over the years. Your generosity sincerely inspires us. P.S. 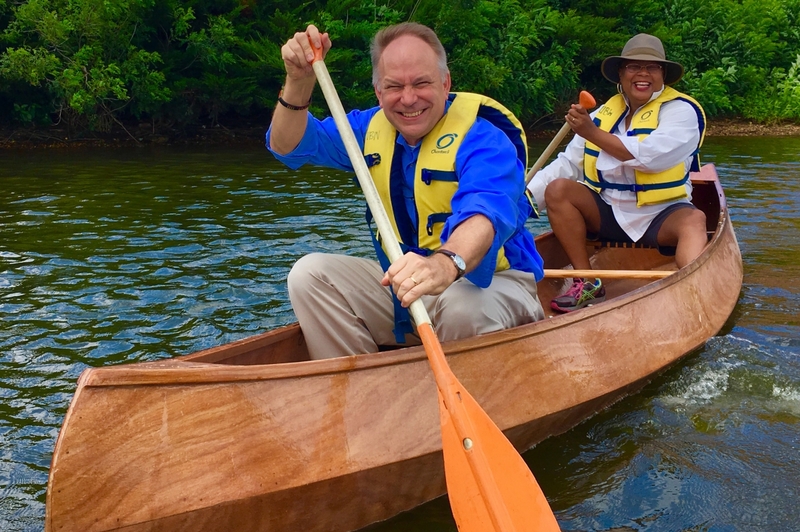 If you donate $500 or more Pam and I will call you from the canoe and give you an update. But depending on how long we have been paddling you may need to provide brief marriage counseling. My favorite scripture is Hebrews 11. I love this scripture because it recounts God’s promises to, and through, people of faith. And each time I look back on my life and recount what God has accomplished, I see His promises have held true, even during the hardest of times… the suicide of my grandfather, the homicide of my fiancée. Yet this scripture also sums up why my faith waivers: while I know that God is in every situation, I also know that life can be very painful. Nothing shakes me like a teenager on the edge. I’m sure you have known young people with the world before them, full of potential, and yet they are involved in high-risk behavior and surround themselves with people who will bring them harm. In Camden, the consequences can be dire for teens who go through even short bouts of normal adolescent rebellion. This reality is one reason I love the Trekker program. White water rafting, camping out solo on an island, mountain climbing, cliff diving, surfing – these are enormous gifts to give a searching, struggling teenager. Faith Kroma came to UrbanPromise just a few years ago as a 9th grader. Describing herself as a Trekker by necessity (“my laugh is too loud and my legs are too long to be contained in a classroom”), Faith took on every Trekker challenge that Mr. C put before her. With the mind of a lawyer and the mindset of an adventurer, Faith charmed everyone she met with her charisma and zeal for life. Yet over the next year, Faith started showing very concerning signs: sleeping in school, fighting with friends, being secretive, running away from home, missing Trekker trips, quitting the StreetLeader program. And then something interesting happened. Faith started being honest. Through discussions about childhood trauma with Nurse Becky, she started sharing some of the very high-risk choices she was making in her life outside of UrbanPromise. Ultimately, Faith found herself in a situation that could alter the rest of her life. Scared, angry, and desperate, Faith agreed to go to Eagle Rock, a partner boarding school In Colorado that fully integrates experiential learning into its curriculum. She would be our first student at Eagle Rock, and not under the best circumstances. One of her first challenges at Eagle Rock was a 24-day sojourn in the woods. She survived. Then came classes, and she did well. But when it came time to settle into school, the issues she was running from returned. It wasn’t long before she was in deep trouble and was being sent home from Eagle Rock. Mr. C and I met with school officials and Faith, and we negotiated a last-chance agreement. Faith would come back to UrbanPromise, engage in therapy and community service daily, and once Eagle Rock was convinced she was ready to come back, they would give her one last chance. That was a hard meeting, and I don’t think anyone was happy at the end of it, especially not Faith. But she held up her end of the bargain. Faith came to UrbanPromise daily for 2 months. She was surrounded by a community that would not give up on her, and she had access to the tools to make different choices. That is what we do at UrbanPromise all day, every day. Not without hesitation, Eagle Rock invited her to return. This time, Faith was ready. She attributes her changed mindset to her work with UrbanPromise’s Wellness Group, reading Emotional Intelligence, and talking through her traumas. She also reconnected to her love of Trekking and earned the privilege of being a wilderness instructor, leading young people on their sojourns in Arizona. 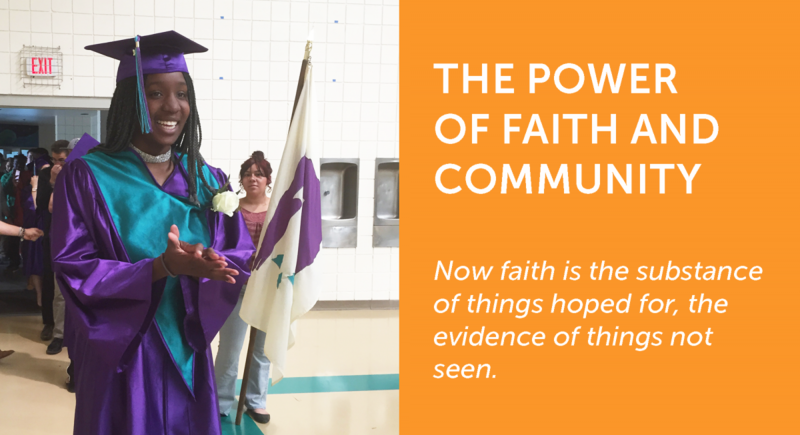 Faith graduated from Eagle Rock during Holy Week in April – what fitting timing for her path to overcoming death and embracing new life! Looking back, it’s clear to see that the crossroads that Faith came to, the choices she made, the tools she employed, and the community that supported her have prepared Faith for life. Faith has amazing dreams for her life. She’s currently preparing to move to South Africa to attend university in Johannesburg. Following this, she plans to teach in the Liberian village where her father was born. I am proud of Faith, and I am proud of the community that came together to support her, a community that never gives up on our children, a community that does not allow teens to throw their lives away. A community that includes you – thank you for investing in our community. As I write, UrbanPromise is facing challenging financial times. We need your help to keep engaging young people like Faith and employing caring staff who can help them navigate the challenges that life presents. 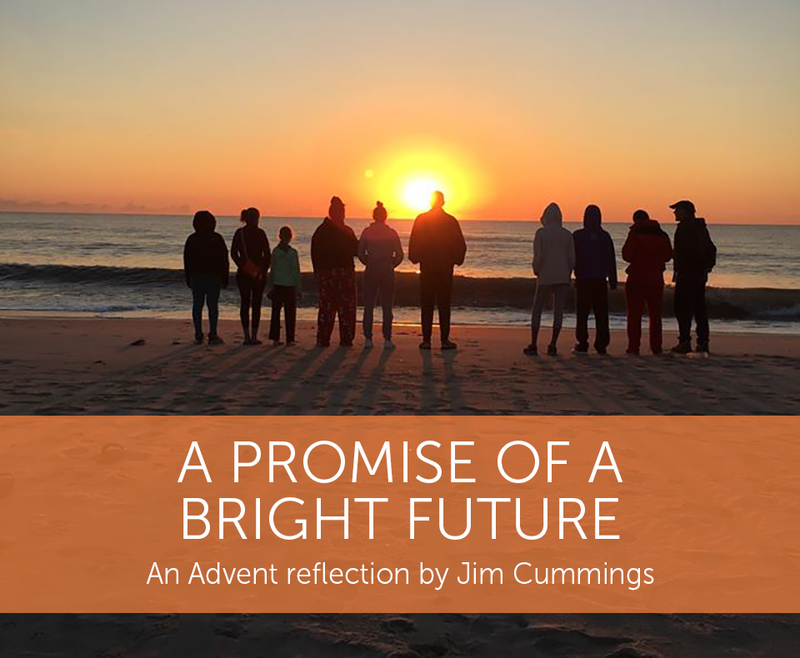 Please consider sponsoring a child, a StreetLeader, or a student at UrbanPromise. I promise that our team at UrbanPromise will persist in loving, supporting, challenging, and equipping our Camden youth…because we need more Faith in this world.